This is the third excerpt, adapted with permission from Wild Lilies, Irises, and Grasses: Gardening With California’s Monocots, edited by Nora Harlow and Kristin Jakob and published in 2004 by University of California Press and the California Native Plant Society. 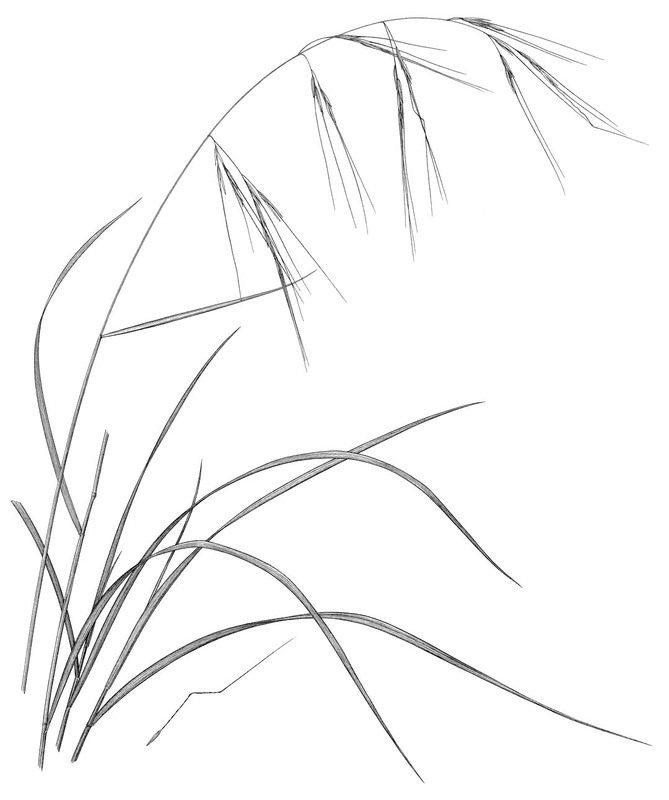 Grasses are members of the Poaceae, or grass family, which has 650 to 900 genera and about 10,000 species worldwide. California’s native grasses have adapted to an enormous range of climates and microclimates, but most of these are characterized by cool, wet winters and hot, dry summers. Two different though sometimes overlapping patterns of growth have emerged, based primarily on when the grass is actively growing. Cool-season grasses start fresh growth with fall rains, flower in early spring to early summer, then set seed and go partially or fully dormant. These grasses tend to be from moderate-climate coastal plant communities where both winters and summers are mild. Warm-season grasses are mostly dormant through the winter, develop most of their growth in summer, and flower in mid-summer to late summer. These tend to be from interior areas of California, the mountains, Great Basin, or deserts. Most warm-season grasses do best with heat during the growing season, and many tolerate considerable winter cold. For both cool-season and warm-season grasses, the growing season is about six months long. In the garden, occasional summer watering will extend or reactivate the growing season of some cool-season grasses, but warm-season grasses seldom grow actively in winter, regardless of climate or watering regime. Some find grasses unattractive in their dormant phase, but, when used creatively, dormant or dried grasses do add color and texture to the garden, and most can be tidied up to a level acceptable even to fastidious gardeners. Some grasses take several years to develop into good specimens, but many native grasses are rapid growers, and these may need dividing or renewal after a few years. Divisions are best done in late fall or winter for most species, making sure that the pieces are kept moist until new growth is established. Renewal may take the form of cutting to the ground, mowing, vigorous raking, combing (long- or short-handled claw-like cultivators or garden hooks are good for this), or other grooming technique as best suits the species; most grasses benefit from occasional removal of dead thatch that builds up within the clump or colony. The gardener can serve as a substitute for nature’s frequent fires or for grazing and trampling by herds of wild elk in times past—both of which removed excess growth and dead residue from the plants. In an increasing number of communities throughout California, regulations concerned with fire hazard may require annual cutting back of grasses. This usually applies to large, meadow-type plantings rather than specimen plants. Gardeners in these areas will need to pay attention to species selection and flowering times, both for grasses and for any associate species, but attractive seasonal landscape effects are still achievable. Mowers set high, or line or blade trimmers, can be used for large areas, while hand cutting works best in more intimate spaces. Most grasses respond well to being cut back to a few inches above the crown; if done after most growth and flowering are completed, this should have no negative effects on the plants. Some species may make a new showing of fresh growth soon after cutting back, especially if they are watered, although the second wave will not be as showy as in the primary growth period. To many enthusiasts of the native flora, purple needlegrass symbolizes California’s extensive pre-European grassland, of which it was a major component. Its persistence today is a triumph over the massive environmental changes and loss of habitat that have occurred in the last two centuries. Some of the better surviving prairies of purple needlegrass, along with Idaho fescue (Festuca idahoensis) and other native grasses, provide a fragmentary glimpse of a largely extirpated California landscape. Purple needlegrass may soon be California’s state grass. This cool-season grass is native to oak woodland, chaparral, and grassland in the valleys and foothills of northwestern California through the Central Valley, and along the central and south coasts, on the Channel Islands, and into Baja California. It forms attractive bunches of fine, flat blades six to twelve inches long, and, in spring and early summer, showy panicles with tailed seeds formed by a bent bristle or awn. The open panicle branches often nod at the tips, and the long awn moves with the slightest breeze. This stately and expressive grass is one of the best for meadow plantings and for controlling erosion on open slopes, and it will tolerate light shade and a diversity of soils. It is a dry grower that can be kept green longer with some summer water. In hot areas, infrequent watering may be best, especially on heavy soils, although, on well-drained soils, it will accept more watering. When dormant, it can be mowed to the ground to encourage new growth and a thicker form, or it can be left as a dry meadow. Purple needlegrass shows considerable promise as a low-maintenance groundcover, but regionally specific management techniques still need to be developed. Seeds can be sown directly on prepared soil, but they must be pressed into the soil for germination. Plants self-sow, forming thicker colonies each year.